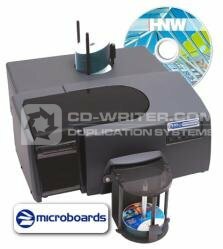 Microboards are proud to announce the launch of their all- new MX Print & Burn series printer/publishers. Designed for industrial environments, the MX-1 and MX-2 come with one or two high-speed DVD/CD recorders, and the industry's fastest, lowest cost-per-disc inkjet printer, all integrated into a robust publishing solution. Also available is the Autoprinter only version, the PF-Pro. All three feature 100 disc input and output capacity, Microboards' enhanced automation for reliable loading and unloading of discs and professional software. Microboards . MX-2 . Disc . Publisher . MicroBoards .